A view of the Rue Saint-Louis in Quebec City. It's the dead of winter, and I'm standing atop the ice slide on Quebec City's Dufferin Terrace. An attendant, his mustache hairs shot through with glittering crystals, roughly drops a toboggan into one of three narrow grooves formed out of ice. While waiting my turn on the snow-covered steps leading to the launching pad, I have befriended Roger Fontaine and his partner Nathalie Allain, young French-speaking Québécois here for the world's largest winter carnival, who now let me clamber behind them on their sled. Without warning, the attendant releases a restraining bolt, and we plummet downhill at 40 miles an hour. Just as I'm wondering how we're going to stop, the toboggan flies off the ice track and grates to a stop on the wooden terrace. That was fun. So fun, in fact, I have temporarily forgotten that it's only five degrees (F) outside. Leaning against the wrought iron railing on the edge of the boardwalk, Fontaine tells me he first experienced the carnival when he was six years old. "Carnival is our way of making the best of the winter," he says. Allain, an elementary schoolteacher, agrees: "There are people who stay inside all winter, or go down to Florida, but there are others, like us, who like to get out and celebrate," she says, as a group of passing teenagers lift long, red plastic horns to the sky, emitting bovine sounds. "Carnival is a way of breaking the winter in two." It's also, as far as I'm concerned, a perfect excuse to get to know Quebec City, one of the most effortlessly quaint cities in the New World. In contrast to the much more populous Montreal, a business center schizophrenically divided between the French and English languages, Quebec City, whose 168,000 citizens are overwhelmingly French in both language and culture, feels tranquil and harmonious. If Montreal calls to mind Marseilles, a cosmopolitan crossroads, Quebec City is more like Lyon, a self-confident center of provincial culture and solid bourgeois values. Although it's the capital of Quebec, the province that's home to the majority of Canada's seven million French-speakers, Quebec City is spared the ennui of early-closing government towns by a certain French talent for fun. People here like to party, and, in a place with a notoriously challenging winter, where up to 11 feet of snow can fall between November and April, the carnival seems to be all the excuse they need. Historically speaking, Quebec City's carnival, like those in New Orleans and Rio de Janeiro, was a chance to celebrate before Lent, the period of fasting and penitence that led up to Easter. 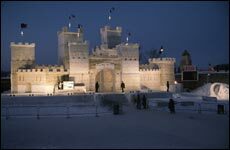 Quebec City's first official carnival, launched in 1894 by the French and English-speaking businessmen who controlled the city, was by all accounts a merry affair, marked by a lacrosse match on skates, a bicycle race on the ice, and a mock siege and surrender of a brilliantly illuminated ice palace. These days, the 17-day-long festivities see a million people braving subzero weather over three weekends in late January and early February. Up until the mid-'90s, the carnival had a reputation for being a bit of a subarctic drinkfest. Now, judging from the thousands of children I see at events like the soap box derby and the dogsled race, organizers have succeeded in turning the carnival into a family event. When the sun goes down, however, the carnival still has its rambunctious side. The drink of choice is caribou, a combination of whisky blanc and port the color of arterial blood, which savvy carnival-goers carry in hollow plastic walking canes. I pause on the narrow, pedestrian-only Rue du Trésor by an outdoor bar made entirely of blocks of ice and watch some fellows from Maine take their first taste of caribou. "Oooh, that's nasty," says the guy in a puffy ski jacket, not quite suppressing a shudder. His friend is more appreciative: "Hey, it's not that bad!" he says, after downing his shot. "Where you going? We gotta stay for another round!" As I belly up for my shot, the barmaid pours me a dose in a plastic cup. It's like a sangria-and-cough-syrup highball, I muse as I sip, one of those deceptively warming, medicinal concoctions whose abuse will pretty much guarantee a morning after of cluster headaches and loose teeth. Wearing a badge in the shape of the carnival mascotthe merry snowman named Bonhommewhich allows entry into the event sites, I set out to discover Quebec City's narrow alleys and icy côtes, its notoriously treacherous hilly roads. From the boardwalk of the Dufferin Terrace, a funicular, an elevator-like incline railway, takes me down a 45-degree track to the Lower Town, one of the oldest neighborhoods on the continent. Around the Place Royale, where French explorer Samuel de Champlain first set up camp in the harsh winter of 1608, are tightly spaced stone houses built in the 17th century, their roofs steeply sloped to shed ice and snow. For the carnival, the narrow streets are lined with whimsical ice sculpturesa horse carriage, giant microscope, moose, and even a pair of carousing pigs drinking from steins of beer. In the port, I board the traversier, a hard-working car ferry, which takes 15 minutes to cross to Lévis, the city where trains used to deposit carnival celebrants a century ago. On the return trip, as the curved prow of the boat sends cracks racing through sheets of river ice, I see Quebec City from river level. From here, the Château Frontenac, a sprawling railway hotel, looks like a clifftop medieval castle surrounded by church steeples, mansard roofs, and verdigris-colored turrets, all cinched tightly by a city-girdling belt of cannon-spiked fortifications. The view is timeless, further evidence that Quebec City has come through nearly four centuries of invasion, renovation, and urban renewal remarkably intact, a fairy-tale European city on North American soil. Back on the Dufferin Terrace, I follow the Promenade des Gouverneurs, a walkway that parallels the cliff-hugging fortifications, and stride up the 310 wooden steps to the Plains of Abraham, the plateau where Canada's most decisive battle was fought. In 1759, invading British troops surprised the soldiers of New France, and in a 20-minute skirmish ended the colonial aspirations of France in North America. Preserved as a park, the plains are now the main site of carnival activities, and the English and French languages seem to coexist with remarkably little friction as vacationers slide down toboggan runs in inflated inner tubes and ride in open sleighs pulled by big-hoofed Belgian horses. People are out in force on this Saturday afternoon, eating bowls of sagamitéan Iroquoian soup based on corn and meatand lining up outside a log cabin sugar shack, where well-wrapped servers let hot maple taffy congeal on wooden sticks. There's also a village of igloos and a kind of mini-Matterhorn where people dangle from ropes as they try ice-climbing. I watch as a young Rastafarian wearing a bathing suit takes a dip in one of the outdoor hot tubs, only to have his moistened dreadlocks freeze stiff in minus 22-degree air. Following a path between rows of snow sculptures, I stumble upon somebody undergoing his first prolonged exposure to Canadian cold. Sai Hua Kuan, a sculptor from Singapore, is standing on a ladder, brushing down a giant white globe with a broom. He is polishing his team's entry in the international snow sculpture competition. The carnival organizers, he explains, compress fresh snow into12-foot-high blocks. Then squads of sculptorsthis year, 50 teams from 18 countriesgo to work with rasps, brooms, and machetes to create outlandish works of art entirely from snow. The team from the Yukon has sculpted a giant raven's head. A Quebec team's work, titled "C'est le but!" ("And he scores! "), portrays three couch potatoes leaping in joy as their hockey team triumphs on a television set. But I'm most intrigued by the Singaporeans' "Looking In." It's a simple globe pierced by a cylindrical hole. "What I want people to do," says Sai Hua Kuan, "is come look in the hole. It's a big eyeball, and it's looking back at them!" When the chill inevitably creeps through my boots, I duck into some of Quebec City's best restaurants, dining on arctic char and sipping exquisite white wine accompanied by a pâté de foie gras in the garden-like atrium of the Saint-Amour, a restored Victorian mansion. I enjoy salmon lightly smoked over cedar chips at the trendy, African-themed VooDoo Grill, where roving drummers let loose on conga drums. The young owners of this multinational fusion restaurant have converted the sprawling office of the late Maurice Duplessis, a former premier of Quebec, into a center of local nightlife. Upstairs, in a bar called Charlotte, guys in tight shirts buy martinis for women with mid-winter tans. Dining out and dancing, I discover, are two more ways the people of Quebec City get through the winter. On Sunday morning, I attend the annual canoe race, perhaps the best expression of Quebecers' joyful defiance of the cold. Before bridges linked Lévis to Quebec City, boatmen ferried mail and passengers between the two cities by halfpaddling, half dragging large wooden canoes across the St. Lawrence River's incompletely frozen surface. Today's race reenacts this pre-industrial commuting service. I watch as nine teams of five rowers slide their canoes across the ice in the dock, then paddle out to open river. Halfway across, they must negotiate a kind of treacherous, disintegrating jigsaw puzzle, leaping from their canoes onto fast-moving ice floes. At least the rowers are working hard enough to generate body heat. Unlike me. In the few seconds it takes to remove my gloves to adjust the earflaps on my hat, my fingers go numb. The race commentator announces that the wind chill is 30 below. I chat with Pascale Aubry, who is leaning against a metal railing at the water's edge, looking maddeningly comfortable in both a hat and warm hood. What's her secret? "You've got to wear lots of layers," she says, pulling up a pant leg and showing me the long underwear she has on beneath her ski outfit. "And not worry about your appearance." By then, the racers are completing the course, and the lead team is hauling its canoe toward the finish marker. It's taken them 42 minutes, 36 seconds. The exhausted competitors trade bear hugs, and the crowd disperses through the streets of the old port, in search of hot chocolate and warm restaurants. When my time at carnival ends, I've not only come to terms with being out in the cold but have also started to discern a certain rough poetry in the winter. On my last morning, I wander the quiet streets, noting how the frosting of snow makes leafless trees look like baby broccoli, and how the air is so achingly pure. I watch the reckless ardor with which tethered workmen swing wooden mallets to dislodge snow and ice from the sloped roof of an 18th-century cathedral, a scene that probably hasn't changed much in the last 300 years. But here's my secret for really enjoying Quebec City's carnival. It involves finding a hotel room with a decent bathroom. Canoe races and ice slides are all well and good, but they're infinitely more enjoyable when you know you're going back to a two-hour-long soak in the deepest bathtub available.